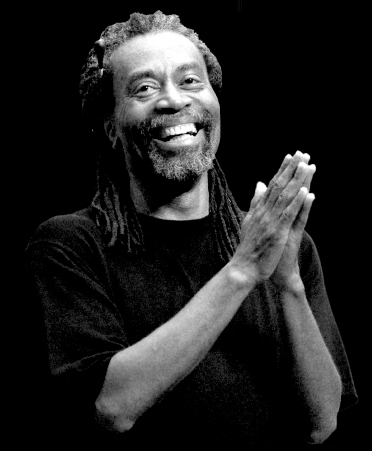 The group was very talented, but I felt they could have mixed it up in both song selection and interaction with Bobby McFerrin. Perhaps it’s my own slant, but the church music is good in moderation. Again, outside of Kyrie (which was from a Mass, but in another language and not so god-y), I could have done without most of the rest of the choral-only selections. Additionally, trading off more with Bobby in both sets would have been better in my opinion. He started off with his standard first song improvisation – which set the stage for his vocal gymnastics throughout the show. He twisted his vocals chords into warbles, gurgles & bubbles. He moved all over the range of several octaves with ease. His style, for those unfamiliar, is much more than the “Don’t Worry Be Happy” guy, but one of vocal experimentation – not quite singing, not quite beat-boxing, not quite human. He’s a one-man band with only one organic instrument. My favorite pieces of the evening were the initial improvisation and the Beatles cover. This show gave me a great taste for Bobby’s music, and I’d definitely recommend seeing him if he comes through your town. Next shows for me? The Melvins on Wednesday (not part of OBF… haha), and OBF’s Tiempo Libre on Saturday.